The previous 16 chapters have sufficed to give us a good sketch of the character of technology, outlining it and delineating it in various ways. But now Borgmann is concerned to give the picture some depth, some attachment to the world that we all live in so as to impress upon us the seriousness of our current social predicament and how the Device Paradigm now typifies the structure of something so essentially quotidian as work. 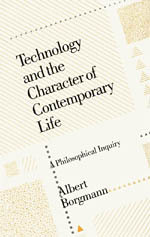 There are of course many other clear examples of the impact of technology in our world, in science, the military, etc… But work and leisure are concepts with which every citizen is intimate, and so showing the radical effect of technology in this sphere is a good way to implicate each of us in its operation. Borgmann’s basic thesis is that “work” as a concept and praxis has split down the middle into “labor” and “leisure”, showing the characteristic rift of a technological device (the rift between ends and means, at the deepest philosophical level). This situation is, he claims, unique to the modern era, and should be interpreted as a direct result of the expansion of the Device Paradigm into more and more areas of human life. So what are “labor” and “leisure”? Leisure he defines as the “unencumbered enjoyment of commodities”, whereas labor is “devoted to the construction and maintenance of the machinery that procures the commodities” (114). So there is an interesting recursive or circular nature to the equation, where work is relegated from the status of something significant in and of itself to a means to the end of leisure. This chapter is dedicated to understanding the concept of labor just described (“technological work”), in technological society. The next chapter will be devoted to the concept of leisure. Why do I say that work has been “relegated” or “degraded”? Borgmann takes for granted that, in pre-technological eras, work was, in at least some contexts, fulfilling and ennobling. He doesn’t claim that all pre-technological work is in this category, but rather that there are concrete existential proofs of this fulfillment. So we can at least ask whether, in our technological society, there is the possibility of fulfilling and ennobling work—whether labor as the means to leisure can be put in this category. Borgmann clarifies that “technological work” is not the specialization of labor (an ancient practice indeed) or the dividing of the work process into discrete chunks (a common strategy for any craftsperson). What’s unique about work in the era of technological society is the division of the work process into the smallest possible pieces, and making a single piece the entire responsibility of a single class of worker. This is what distinguishes the artisan from the assembly line worker: the artisan who makes a hundred objects might divide the work process into distinct stages and tackle each stage for all products at once; but she is at the end of the day responsible from start to finish. The assembly line worker, on the other hand, is responsible for only a tiny piece of the finished product, a piece which has been removed from its context and which makes it difficult for the worker to self-identify as an owner or craftsperson. So why did we move to an assembly-line model? What are its advantages? Adam Smith and other early proponents of a (proto-)technological approach to labor thought that being responsible for just one small task would enable a worker to perform that task with the highest degree of dexterity. This in turn would promote an emphasis on the twin values of reliability and productivity (part and parcel of the concept of technological “availability” discussed earlier). Reliability and productivity are at their highest when so many “human” elements (individual judgment, mood, energy, attitude, etc…) are eliminated from the production process. In the limit, of course, this means doing away with the human as producer entirely (which we’ll get to in a moment), but before robotics was a viable solution, it meant narrowing the window of responsibility for the individual human worker to something small enough that that person’s individuality could not impress itself upon the final product. Of course, whether this actually promotes “dexterity” depends on what you mean by that word. As Borgmann says, if you mean trained ability of bodily timing, strength, and overall care and precision, then the assembly-line model actually eliminates dexterity. In addition, dividing labor in this way, in every instance where it springs up, always comes to replace an existing societal structure, splitting that structure into the twins of production and commodity. Borgmann gives the example of insurance—before financial instrumentation became sophisticated, securing oneself against the vicissitudes of life involved a network of neighbors or guildmates who, to a greater or lesser degree, ameliorated the pain of individual loss. As security has now become technologized and commoditized, it can be had much more reliably, plentifully, and without the social awkwardness of asking for help; it can be had with cash. But in this way we have also of course lost something hard to define—a sense of community or trust in one’s fellow creatures, perhaps. These claims about technology’s dulling effect on the character of work are not intended to be universal: technology does provide extremely satisfying work… but primarily for those involved at the forefront, the leading edge of the technical enterprise. The engineers, programmers, and entrepreneurs who uncover a technological solution to a problem follow a challenging and rewarding path to that solution, a path often full of energy, vigor, and the sense that one’s capacity is being tested, enlarged. But in our wake (and I say our for I’m such a technologist professionally) we leave a “wasteland of divided labor”. The skill taken to divide a kind of work into its smallest manageable components is interesting and rewarding, but for those who are left with those bite-sized chunks of labor as their livelihood, the satisfaction is greatly lessened. Work that was previously done by an artisan can now be done by the combination of machine and unskilled worker (or eventually, entirely by machine). Borgmann points out that this situation should be really embarrassing for liberal democracy, which as we saw in an earlier chapter lists the maximizing of human potential and fulfillment as its chief aim. But like social injustice, as a society we are content to bear the degradation of work for the technological promise of liberation. And so we readily believe that yesterday’s work force is “outdated” or must be “upgraded” to adapt to the digital age (rather than asking whether these “upgrades” actually give greater satisfaction to those whose work is radically altered by them). Or we claim that the greater length of education reflects a higher degree of training necessary for working in the modern world (rather than allowing that it might be artificially lengthened by the generally decreasing need for labor—education as labor’s “waiting room”). Or we ignore that it is an ever-shrinking pool of technological elites that provide the driving force of technological progress. So far we’ve argued that we do mask the ongoing degradation of work, even in a liberal democracy that strongly believes in the dignity bestowed by work. But this doesn’t explain why we’ve done that. How was it ever possible? In fact it was a long and sometimes violent process to mold workers into assembly-line worker bees. Convincing craftspeople to give up ownership of the entire production process was a hard sell, at first. And it would be easy to find blame with early entrepreneurs or capitalists, who sometimes viciously forced workers into this new cast. But Borgmann sees the deepest answer in the promise of the Device Paradigm itself—the promise of liberation and enrichment. And we as a society have been happy to pay the price for this. We’ve traded in satisfaction in work for the lessening of burden and the promise of leisure, implicating ourselves in this rift between “labor” and “leisure”. (And I don’t think I need to quote American TV-watching statistics for you to have an understanding of what “leisure” typically means in our culture). This trend is only going to continue. Borgmann, writing over three decades ago, looks ahead to the “microelectronic revolution”, which has long since ascended to the status quo. Devices have become so compact and complex that only a small group of experts can truly tell you what’s going on inside. Fixing an individual microchip by hand is of course out of the question. But devices built around these ineffable-to-us constructs form an ever-greater portion of our daily lives. The current revolution, that of software (which was crowned king by the Internet), pushes things further in this direction. The fad in the San Francisco startup culture where I am embedded is all about “disrupting” existing markets and ecosystems—and of course, pre-software or pre-Internet ways of life. Ultimately what we are disrupting is work itself; through a combination of robotics and software engineering, it will be eliminated entirely. So what then? Will we develop respectable and enjoyable modes of unemployment (which heretofore has been a social standing lacking in dignity)? Will our “work” essentially become “busywork”, with no real value? Or will work be redistributed across available workers so that average work time is reduced, and leisure time increased? And in any of those scenarios, the crucial question becomes: what will we do when we’re not working? And will it be worth doing? For that, we’ll have to await the next chapter: “Leisure, Excellence, and Happiness”.